systems, specifically solenoid systems versus DC-to-DC chargers. Before you rush off and make a purchase, we have some advice on split-charging systems. The debate on which system is best (solenoid or DC-to-DC) has been raging for years. Unfortunately, the subject is shrouded in unsubstantiated opinions and a lack of research. To date, there have been no tests that prove that one system is better than the other. One possible reason for this is that there are so many variables that such a definitive statement could never be made. The other problem is the unchallenged belief that if something is more expensive, it must automatically performs better. This argument is further supported by the fitment industry, in which many 4×4 “experts” recommend expensive DC-to-DC chargers because the profit margins are higher; and they also make the mistake of assuming that the more expensive option is automatically better. If the alternator’s output is 13,7 V or more, a solenoid system will generally recharge faster than most DC-to-DC systems. However, over time, the DC-to-DC system will catch up and restore 100 % battery power. But these results will greatly vary according to what type of battery is used. What’s more, if the supply voltage is below 13,5 V, the results will differ, and (once again) be heavily influenced by the type of battery. don’t know the specific output of their vehicle’s alternator. So let’s start with things that you do know – like your budget and typical driving time. 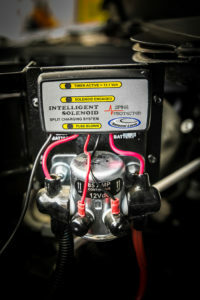 a split-charging system only to wire it up to an incorrectly matched battery. That said, the desired application also influences your choice of battery. National Luna’s advice has always been, buy the best battery you can afford! For most people, this will be a Dry Cell, EV Traction battery. This type of battery is considerably more expensive than a flooded (wet-cell) deep-cycle battery, but the performance variation is vast – it would be like comparing the off-road abilities of a Land Cruiser 70 to those of a RAV4. DC-to-DC system. The battery was discharged by 110 Ah (close to 80 %). You’ll see that (initially) the solenoid system delivers a much faster recharge rate than the DC-to-DC setup. But over time, the advantages of the solenoid system are reduced, and the DC-to-DC charger starts to take the lead due to a higher final output voltage. From a marketing perspective, the DC-to-DC charger is punted as a superior setup, but from a practical perspective, in this case, the solenoid system dramatically outperforms the 20 A DC-to- DC charger in the first six hours – where it matters. Realistically, most of us don’t drive for more than six hours every day while we’re on holiday, in which case the solenoid system will generally restore more charge to the battery than a 20-amp DC-to-DC charger. Of course, DC-to-DC chargers with higher current ratings are available, but they tend to come at a significantly higher price. In summary: If the alternator voltage is lower than 13,5 V, the DC-to-DC system becomes favorable, but consequently, as the alternator voltage increases, the performance gain of the solenoid system becomes more apparent. One way to compare these two systems is to think of the race between the rabbit and the tortoise. The tortoise may win overall, but that’s only when a long-distance comparison is made. For shorter distances, the rabbit gets there faster. So which system is best? Again, that will depend on your budget and vehicle setup. But in the opinion of National Luna (based on the example above), your best bet in terms of performance and value for money would be the fitment of an AGM (dry cell) EV traction battery, a low-cost (mechanically bulletproof) solenoid system, and a high-quality 220 V maintenance charger. That setup will ensure the best possible recharge rate, while guaranteeing maximum battery life and performance over time. This brings us to our final point: no matter what split-charging system you use, we highly recommend the use, and frequent practice, of connecting your auxiliary battery to a 220 V maintenance charger when not in use. Unless you’re driving for very long periods (more than 18 hours), it’s highly unlikely that your auxiliary battery will ever be 100 % recharged – regardless of which split-charging system you use. Next Next post: Watter Dubbelbatterylaaiers Werk Die Beste?